The Vamps descended upon Australian shores over the weekend for a special one-off show at Sydney’s Allphones Arena. Supporting the band, who’ve placed in the Aussie top 20 twice thus far (with their breakout hit ‘Can We Dance’ and alongside Demi Lovato on ‘Somebody To You’) were Aussie boyband At Sunset, Tyde Levi, The Tide and Little Sea. We sent along roving reporter, Vamps lovers and auspOp reader Montana to see what all the fuss was about. Sydney’s Allphones Arena was packed with young, teenage fangirls ready to see heart-throbs The Vamps play their first ever arena show in Australia and unfortunately, they did disappoint. Music star Troye Sivan’s younger brother, Tyde Levi, was on hand to get the crowd energised with his awesome DJ set. Australia’s own At Sunset, although unfamiliar to a lot of the crowd, performed a few of their original songs to attempt to get the crowd excited for the band they had all been waiting to see. Both Little Sea and The Tide were the standout supporting acts, getting the crowd singing and dancing, which is particularly hard for an opening act. 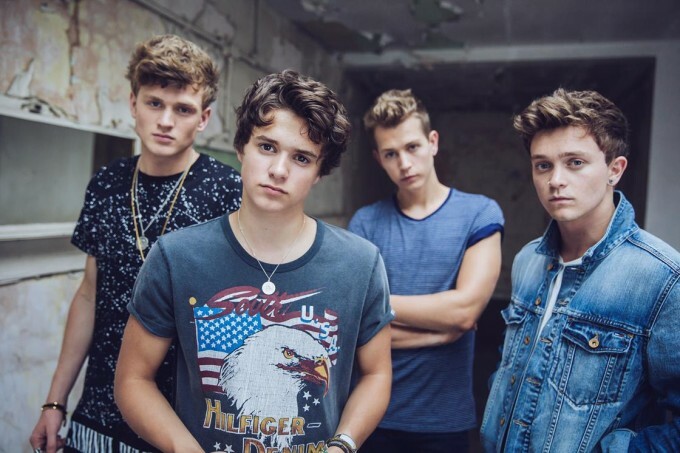 The length of all four support acts left fans craving the music made famous by The Vamps. Overall, The Vamps performed a disappointing set to the arena, which had empty seats everywhere. The staging was messy and the lighting made it hard for anyone who wasn’t in the front row to see any member other than the charismatic lead singer, Brad Simpson. But even thought there was only half a crowd present, as soon as the band hit the stage, there was no lacking of energy, nor passion for the music. Though Brad had been struck down with a case of tonsillitis days before the big show, his vocals did not disappoint. His live performances sounded exactly like the recorded versions of the songs and carried the band to a great live performance. Drummer Tristan Evans moved away from the drums to take on the rap verse, originally by Silento, in the song ‘Volcanoes’, which posed as a fan favourite moment of the night as it showcased the multiple talents of the band members. His drum solo also gave him a chance to show off his real drumming talent. Guitarist, James McVey and bassist, Connor Ball continually interacted with the crowd, making the entire audience feel like they knew the band personally. Popular songs such as ‘Wild Hearts’, ‘Can We Dance?’ and ‘Oh Cecilia’ got the whole crowd up and singing along; even the parents who were bought along by younger fans of the band. Even the less successful singles ‘Wake Up’ and ‘Rest Your Love’ made the arena feel like a party. There was not a single person sitting down throughout the show. The setlist was lacking great songs from their album ‘Wake Up’. They were seemingly replaced by singles off their first album. A majority of the fans at the show had seen the last Australian tour, so there was a feeling of disappointment throughout the arena. Although the singles off the first album are crowd favourites, it would have been nice if the band included a lot more from their second album, even though it was not as successful as the first. The concert was enjoyable for most fans, but lacked the excitement that was felt during The Vamps Australian tour in 2015. A few changes to the setlist and lighting setup would have improved thing and given The Vamps the full potential for an incredible arena show.